N’Golo Kante has put pen to paper to sign a new deal with Chelsea. The Frenchman has agreed to extend his stay at Stamford Bridge until 2023. Kante has been a key part of Chelsea’s starting line-up since his £32m arrival from Leicester City during the summer of 2016. Under the management of Antonio Conte, the world cup winner was a pivotal part of The Blues Premier League title success in 2017. Playing a midfield holding role, Kante’s overall workrate is one of his strongest assets. The former Caen man has been used in a slightly different role under current boss Maurizio Sarri. Even so, the diminutive midfielder is very happy with life at Stamford Bridge. The 27-year-old is without doubt one of the best players in the Premier League. He scooped a hat-trick of ‘Player of the Year’ awards in 2017. His ability and overall persona is of great credit to him. 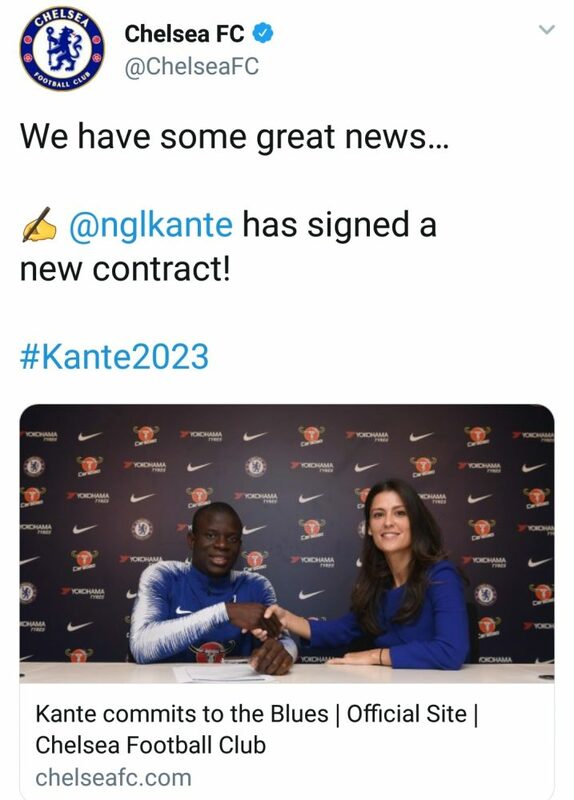 This deal will be a relief for Chelsea. Speculation linking him to a number of clubs has been evident since the end of last season. Barcelona, Juventus and PSG were all reportedly interested. There are a few question marks over where Sarri should play him in his starting XI. Well suited to the holding role, he is currently being played on the right-hand side of a midfield three. Kante is becoming accustomed to his new role, as the entire squad continue to get used to what has been dubbed ‘Sarri-ball’.